The brilliantly titled Lads with Sticks is the brand new EP from Dubliners Overhead, the Albatross. Unleashed with little pomp and no ceremony on bandcamp last week, it’s a masterful post-rock record. Everything about it is clever, from the name to the album cover to the tongue in cheek post-al-service bandcamp labels. Perhaps it’s time someone started the post-review genre of writing? Whatever you want to call it, these are four fantastic instrumental rock tunes. All the tracks have a full, fat sound; they’re all so well arranged, so beautifully textured, and flow so well. The musicianship is first rate, and there’s riffs galore to be found throughout. Track #2, ‘Forgive Me Not’ is a real highlight, with its bounding melody and collection of superb guitar lines (yes, collection, Overhead the Albatross have no laurels to rest upon). Everything about this EP seems effortless, but the amount of care and precision gone into it has to have been immense. Take Liam Neeson for example, starting off intense before catching its breath, it then returns to greatness with an intense build-up and a glorious crescendo. Closer ‘Footprints in the Blood Soaked Snow’ is an immaculately layered production, and defies being merely categorised as post-rock. 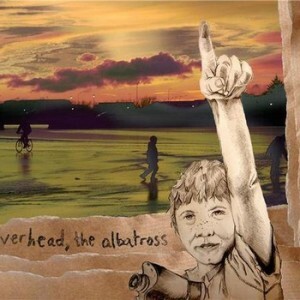 Everything about Overhead, the Albatross is so much more than that. It’s hard to believe that the band have created something so perfect first time of asking, and a lot of pressure will be on when they follow this up with a full-length on the ElevenEleven label. While you lap up these gorgeous sounds, why not check out the band’s fantastic tumblr blog?